Interview with MAXX Brides & a little tip for brides! | beauty. bikes. Interview with MAXX Brides & a little tip for brides! 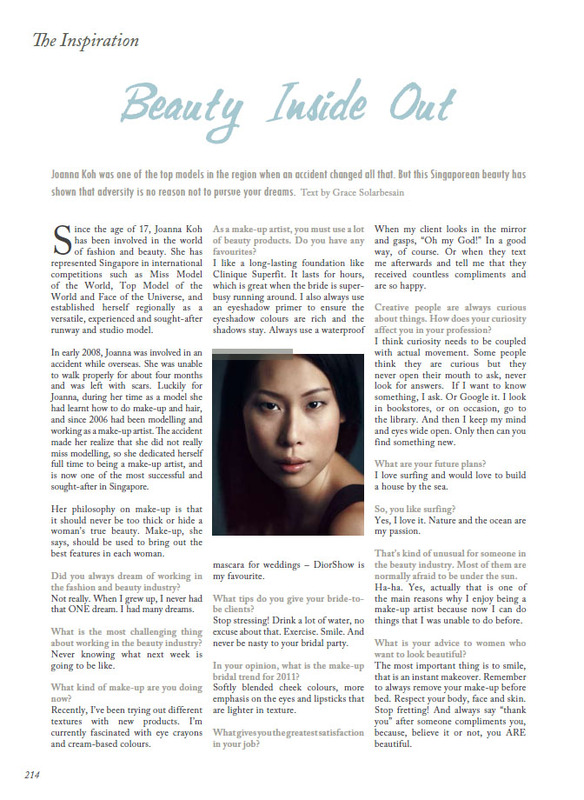 Maxx Brides Magazine (Indonesia) featured me in an interview under a section called “The Inspiration”. WOW.. I do hope I can live up to that! Click on the photo below to read the interview. Today I was reading an interview in US Edition of ELLE, and it was with Dr Brandt. I am a big fan of his Pores No More range!! His reply? Do something to reduce stress, because stress increases free radicals, and there’s evidence that it disrupts the replication of your DNA and shortens your chromosomes, leading to premature aging. In my interview above, I was asked what tips do I give my bride-to-be clients. And I said, STOP STRESSING! Coincedence? We’re thinking along the same lines! It’s true, I’ve met brides before their wedding day, from a year before, to a few months to weeks to days.. the stress takes a toll on their skin and health, and it shows. No makeup can fully bring back the brightness into the skin. We can fake it, but you will feel it.